• A modern interpretation of the three legs of man. This collection is part of our 2017 issue programme and as such they will be supplied in accordance with the requirements of your standing order. Variable rate definitive self-adhesive stamps' are known as 'Post & Go stamps' and 'Faststamps' in a number of other jurisdictions, they are popular, highly collectible and viewed as the next generation of self-adhesive stamps. Each stamp features the stamp value, date of issue, sequential number and stamp identifier. To help you understand our handling of this item below is some further information as some aspects are different to other postal administrations. 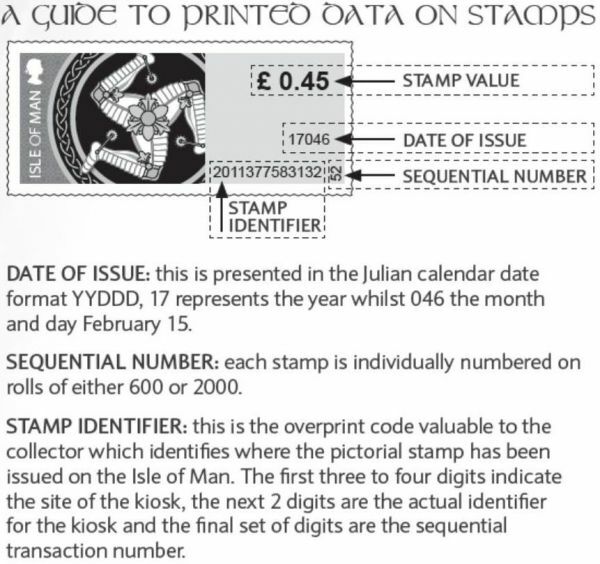 • The Triskelion stamp issue is a set of four stamps which are part of our normal issue programme and will be supplied in accordance with your standing order requirements for commemoratives. • The set of four stamp designs will be available as collector items – mint/cto set, first day cover and presentation pack. • The stamps will form part of our year collections and will feature in our 2017 Lindner pages as a strip of 4. These stamps are available from across our network of self service kiosks. The stamps are also avilable from Pulrose, Governor's Hill, St John's, Foxdale, Union Mills, Ballaugh, Sulby, Ramsey Sorting Office, Southern Delivery Office and Kirk Michael Post Offices and will be rolled out to the rest of the network by the end of 2017. Isle of Man Post Office is pleased to mark the launch of its new variable rate definitive self-adhesive stamps at Pulrose Post Office Douglas on Tuesday 18th July 2017.